There are plenty of unicorn presents for toddlers in my house. My daughter is obsessed with the mythical creature. There’s always at least one unicorn gift under the Christmas tree – and usually more. But I really don’t mind. 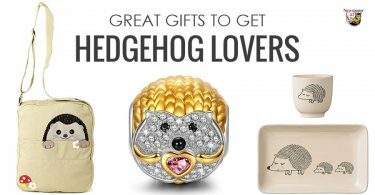 They’re all so sparkly and beautiful! 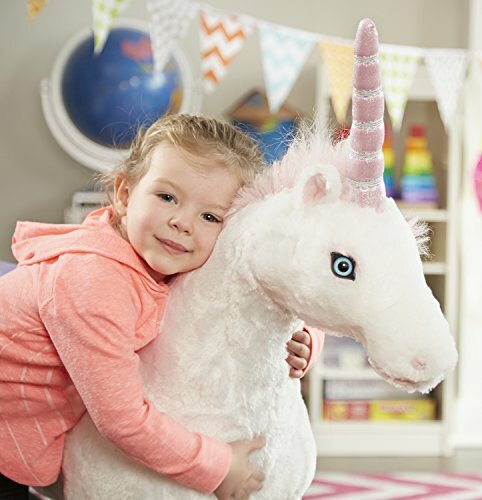 Melissa & Doug Giant Unicorn Stuffed Animal Found Here – This very large unicorn stuffed animal is a Melissa & Doug toy that made Amazon’s Holiday Toy List. Needless to say, grab it early. I expect the price to rise the closer it gets to Christmas. At nearly 3ft tall, this unicorn spurs a child’s imagination, and it’s soft hair and sparkly details make it an instant favorite. 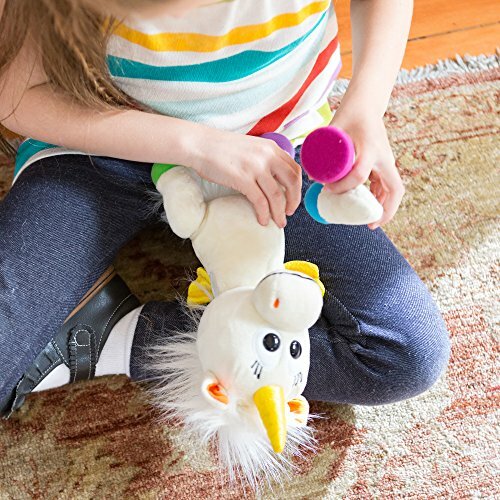 Woodyotime Interactive Moving And Talking Unicorn Found Here – This interactive unicorn toy moves and talks to your child by repeating what they say. The comical voice can get quite hilarious, and it’s great for helping to develop language skills. It also makes a great companion. 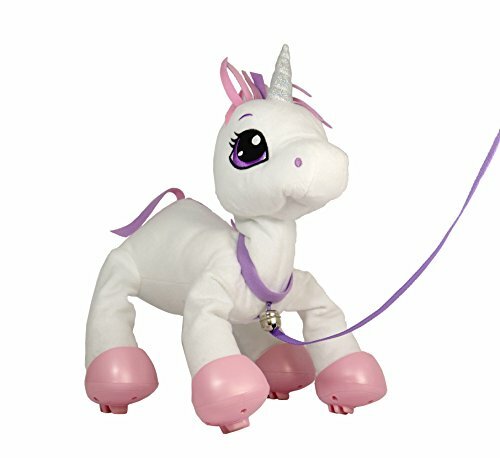 Animoodles Magnetic Iris Unicorn Stuffed Animal Plush Found Here – Next on the list is this magnetic unicorn stuffed animal from Animoodles. This unicorn features 6 interchangeable plush parts that are held together with magnets. I like it because it helps kids build fine motor skills – they love taking it apart and putting it back together – but also allows kids to explore their imagination by putting the parts wherever they want them. A leg for a head? Silly and PERFECT! By combining the unicorn Animoodle with other Animoodles like this lion, this sloth, or this orangutan, kids can create all kinds of strange and exciting creatures by mixing and matching parts. 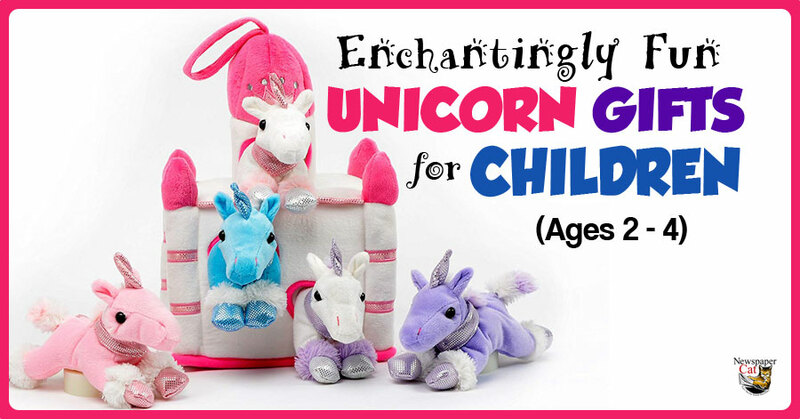 This is a fantastic unicorn gift for a 3 year old. 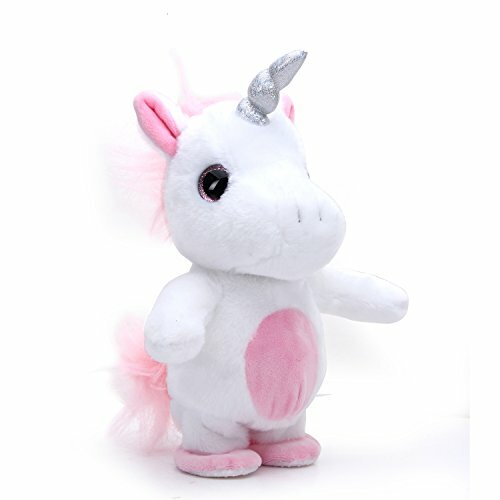 Peppy Pets Unicorn Plush Found Here – If your child or grandchild is always on the move and likes to take his or her toys everywhere, consider giving the Peppy Pets Unicorn plush as a gift. These toys are designed to be pulled along by your child. It’s just like walking your own pet, only this one will be much better behaved! Smart Gear White Unicorn Ride On Toy Found Here – This toy is kid-powered and provides a fantastic form of exercise. It’s great for growing muscles, staying healthy, and building coordination, timing, and rhythm. 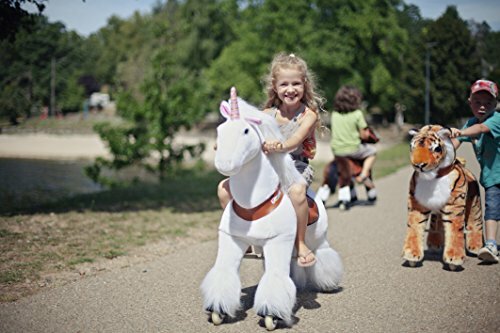 By bouncing up and down on the saddle, a child can propel the Smart Gear White Unicorn Ride On Toy forward in a galloping motion – just like riding on the real thing (or so I’ve heard as I’ve never actually been on a unicorn before). Also, the wheels do not roll backwards which is a nice safety feature – no more mini heart attacks when your child starts to roll backwards down the driveway! Two and three year olds might have a little difficulty getting the hang of it (although I wouldn’t put it past them), but it’s an incredibly fun unicorn gift for 4 year olds. 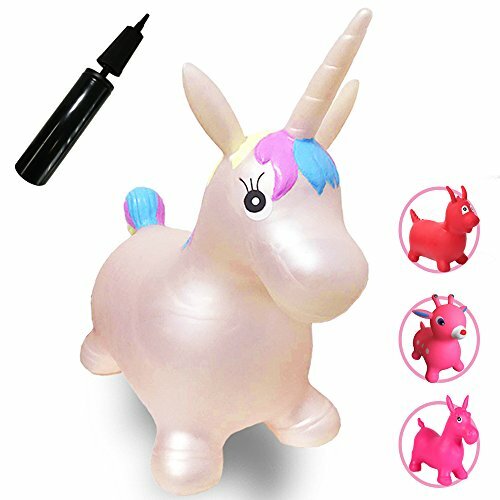 Runyuan Inflatable Jumping Unicorn For Kids Found Here – As another great form of exercise, this inflatable jumping unicorn also promotes balance, coordination, spatial awareness, and strengthens core muscles. Kids can bounce their way to a good time inside or out, and no matter how dirty they get, this is one unicorn gift that is super easy to clean! 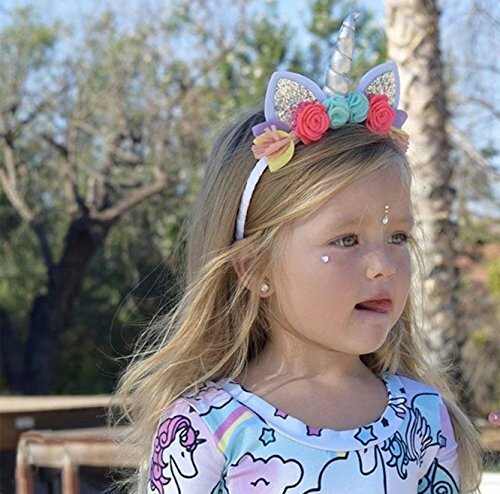 California Tot Unicorn Crown Headband With Glitter Ears & Felt Flowers Found Here – Like most toddlers, my daughter LOVES dressing up, and she “geeks out” anytime she sees a unicorn headband at the store. Unicorn headbands are a great gift idea for 2-4 year olds because they spark imaginative play – not to mention being OMG cute for photo opps! With its glitter ears and felt flowers, this one is gorgeous, and will provide hours of play fun. 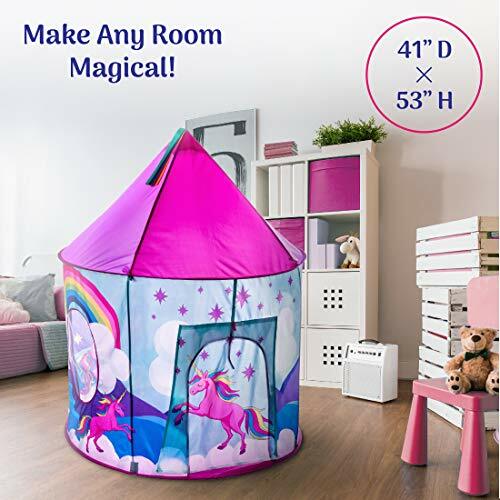 Kids Unicorn Play Tent And Magical Unicorn Headband Found Here – Kids love play forts, and this one is perfect for any child who loves unicorns. It even comes with a matching headband. You can set it up indoors or outdoors in good weather, and it’s perfect for a play date. Combine it with this amazing unicorn chair and give your child the perfect private hideaway for looking at books, playing, or just hanging out. 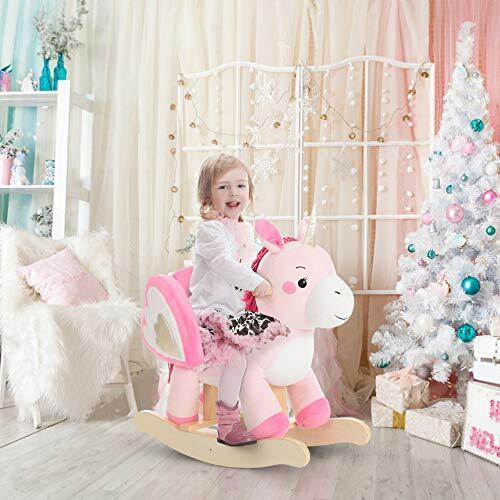 Labebe Unicorn Rocker Toy Found Here – Next on the list of children’s unicorn gift ideas is this Unicorn Rocking Horse Toy by Labebe. Rocking back and forth is not only fun, but can also be very soothing for young children. This rocker is adorable and makes a great unicorn gift for a 2 year old. 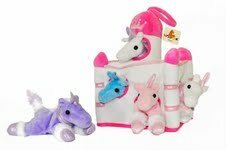 Plush Unicorn Castle With Five Stuffed Animal Unicorns Found Here – This playset features 5 soft unicorn stuffed animals and a plush castle that also serves as a carrying case for the unicorns. With a handful of unicorns, it’s great for imaginative play dates and for teaching kids about sharing with friends. Makes a wonderful Christmas or birthday gift for any young unicorn fan.